The NKJV Compact Ultrathin Bible is easy to read and easy to carry. Available in a wide variety of colors and bindings, its features include four full-color maps, a presentation page, and two-piece die-cut gift box. 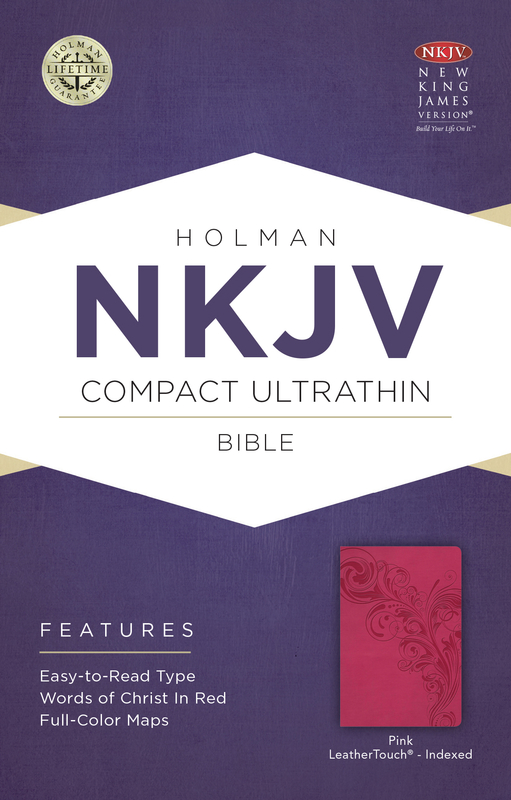 NKJV Compact Ultrathin Bible, Pink Leathertouch, Indexed by Holman Bible Staff, was published by Holman Bible Publishers in November 2016 and is our 66843rd best seller. The ISBN for NKJV Compact Ultrathin Bible, Pink Leathertouch, Indexed is 9781433646478. Be the first to review NKJV Compact Ultrathin Bible, Pink Leathertouch, Indexed! Got a question? No problem! Just click here to ask us about NKJV Compact Ultrathin Bible, Pink Leathertouch, Indexed.